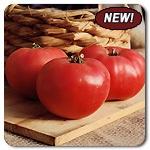 HEIRLOOM Dark, rose-pink hue and well-loved heirloom flavor that is not too tart, nor too sweet. A tomato taste test topper at Phillies Bridge Farm Project in New Paltz, New York as well as in the HMS trial gardens. Round fruits are 4-8 oz with meaty flesh perfect for slicing. Soft-skinned, but not overly fragile and holds up well against cracking. Indeterminate. 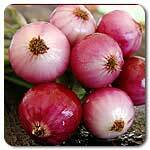 Beautiful purple top mini sweet onions for fresh eating! 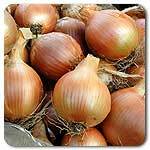 Early harvests and mild onion flavor for salads, sandwiches and pickling. The ultimate sandwich onion! Blackish, purple-maroon, glossy skin and interior ring color that continues to develop during storage. Deeper red than Red Bull, with a rounder shape. Uniform, large, round globes average 3-4”. Very hard bulbs indicate its excellent storage ability. Long day.